3D printing is hailed as the technology of the future. Although the technology has been around for a decade, it is only recently that several rapid advancements have been made. Creating functional and customized objects seems more of a reality now. The raw material used by 3D printers is usually plastic: either acrylonitrile butadiene styrene (ABS) or polylactic acid (PLA). The plastic is available in the form of filaments that are 1.75 millimeters or 3 millimeters in width. These filaments are stored on a spool that is attached to the 3D printer. Instead of directly buying plastic filaments, which are expensive, a filament extruder can be used. Cheaper plastic beads or recycled plastic can be fed into the extruder to obtain plastic filaments. The filaments are fed into the 3D printer’s print head. These filaments are liquefied by passing them over a heated tube before they are extruded from the pointed nozzle of the printer. 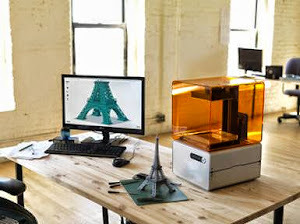 3D printers build objects by laying down layers of plastic, using directions given by the design uploaded onto the computer connected to the printer. Other materials like ceramic, brass, and steel can also be used as raw material for a 3D printer. Researchers at Michigan Technological University have published a study that shows how buying a 3D printer and using it to print 20 household items in a year can save enough money to compensate for the cost of the printer. Items like showerheads, cell phone accessories, garlic presses, spoon holders, or toys can be printed at home at a fraction of their retail price. These researchers used a RepRap printer that cost $575 and selected 20 free designs available online. The cost of a showerhead in retail stores currently varies between $8 and $437, whereas the cost of printing it using a 3D printer is $2.53 (including the cost of plastic and electricity). The study showed that savings were the highest when used to print objects that needed customization such as orthotic insoles for shoes. These products cost $500 to $800 to buy on the market, whereas they can be printed on a 3D printer for as low as $2. A database of designs such as that found on the website called Thingiverse provides open-source files that allow people to download them for free. This is a key factor in saving money when 3D printing objects. Buying plastic filaments or other forms of plastic raw material for your printer can be expensive. However, the cost can be brought down by making your own plastic filament from things like old milk jugs! A study conducted by Joshua Pearce and his colleagues at Michigan Technological University shows that making plastic filament from milk jugs uses 3 percent less energy than recycling them by conventional methods. The researchers used ordinary milk jugs made of HDPE plastic. After cleaning them and cutting them into pieces, they shredded it using an office shredder. Then, they fed the shredded pieces to a RecycleBot to obtain plastic filament. HDPE plastic is not the best choice of raw material for 3D printing since it shrinks slightly when the object is being created. This flaw has to be kept in mind when designing parts. However, if items like a pencil holder or a statue are being made, then this problem does not matter. The cost of filament for 3D printers lies between $36 and $50 per kilogram in the market, whereas the cost of making your own filament using recycled plastic is 10 cents per kilogram. The Buccaneer Cloud 3D printer costs around $350. It is marketed as the easiest-to-use, functional, and most-affordable 3D printer. The Printrbot costs between $399 and $699. It is aimed at hobbyists, however there are some “starter” models as well. A Printrbot kit costs less ($259-$299) because you need to assemble it yourself. The RepRap costs between $700 and $1100, depending on the model. It is a community-run project, and many types of RepRap printers exist. Lulzbot is a type of RepRap printer that has the backing of Aleph Objects, Inc. RepRap printers can create many kinds of objects, and can also print its own parts that have to be later assembled to create a new RepRap printer. The Cube 3D Printer is a consumer-friendly 3D printer that costs around $1300. It is available in different colors to match the décor of your house. It does not have to be assembled, it comes along with free models that can be printed, and it can use Wi-Fi to print objects. The Up! 3D printer is similar to the Cube 3D printer in terms of consumer appeal. The Up! Mini costs $1000, the Up Plus costs $1600, and the Up Plus 2 costs $1800. The Makerbot Replicator costs $2200. This 3D printer defined the genre. It can print objects in different colors. It produces high-resolution and smooth 3D printed items. It has the capability to produce moving objects and interconnected components. The CubeX 3D printer costs $2500. It has been developed by the makers of the Cube 3D printer. However, it is an improvement in the sense that it prints high-resolution, larger, and professional parts. It can print objects in different colors and it can print several objects in a single array. In addition, it can use different types of plastics simultaneously when printing objects. For information on the other types of 3D printers available (and there are plenty more! ), you need to look up Engadget. This website contains descriptions of all types of models, be it personal or professional. Thank you for reading Save Your Bucks and Know the Benefits of Using 3D Printers posted on the website Kwentology if you want to redistribute this article please include the link as the source. Have some kuwento to share? Contact us!